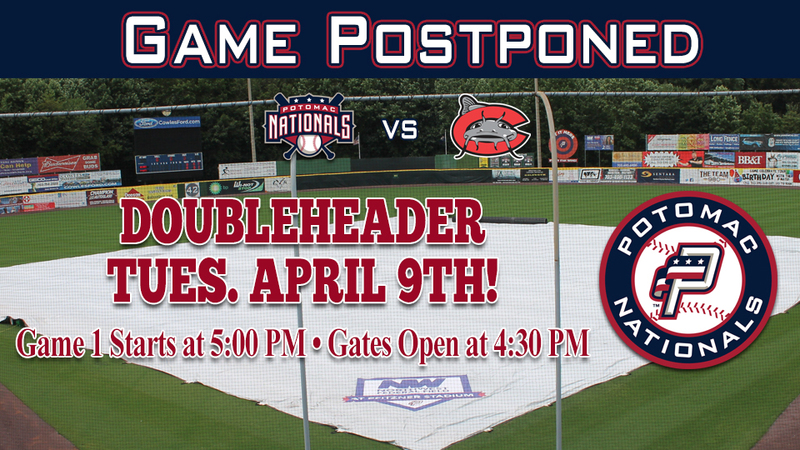 Woodbridge, VA---Rain has postponed Monday night's series opener between the Potomac Nationals (3-1) and the Carolina Mudcats (2-2) at Northwest Federal Field at Pfitzner Stadium. Monday night's game vs. Carolina will be made up as part of a doubleheader on Tuesday, April 9th at Northwest Federal Field, with first pitch of game one scheduled for 5:00pm. Both games are scheduled for seven innings. Gates for all fans will open for the doubleheader at 4:30pm.